At the 1988 Winter Olympics in Calgary, British ski jumper 'Eddie "The Eagle" Edwards' not only surprised everyone with his tenacious performance, but won the hearts of a nation at the same time. 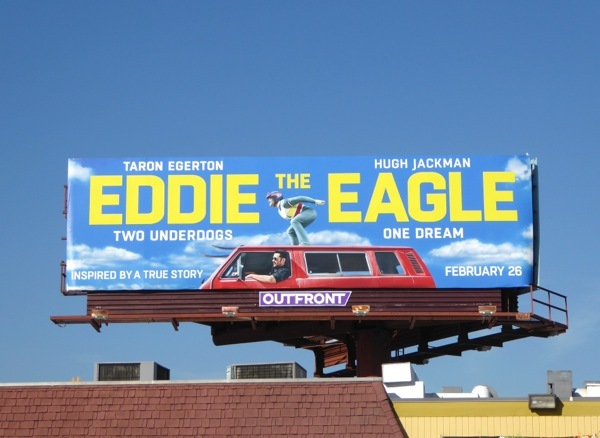 Taron Egerton plays the lovable skiing underdog who was the first person to represent Great Britain in Olympic ski jumping, challenging the establishment with the help of his charismatic, rebellious coach, played by Hugh Jackman. 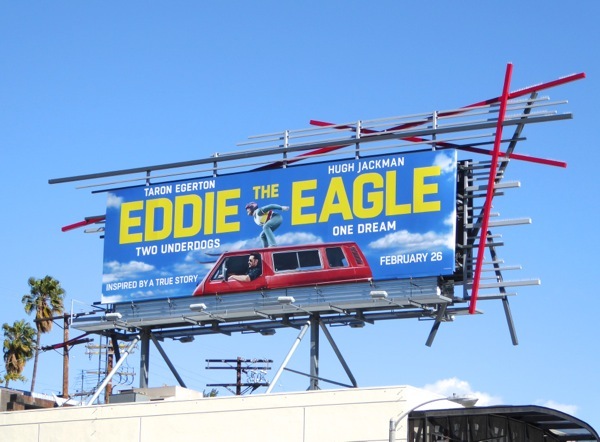 The billboards for this feel-good film based on a true story were first snapped along Olympic Boulevard (how apt) on January 29, then later along West Hollywood's Sunset Strip on February 1, 2016. 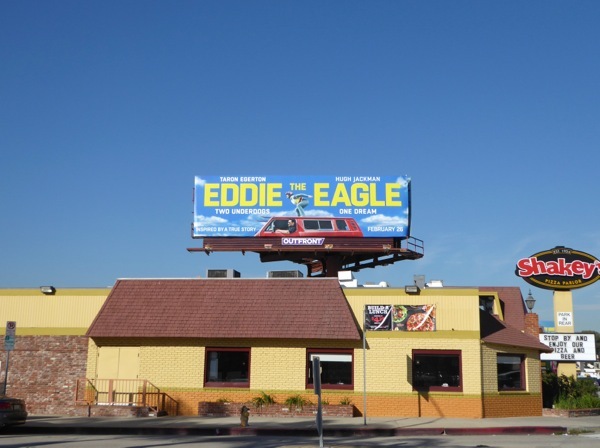 For more sports-themed movies, be sure to also check out these Draft Day film billboards, Million Dollar Arm billboards, 7 Days in Hell billboards and Real Steel movie billboards (fighting robots count, right? 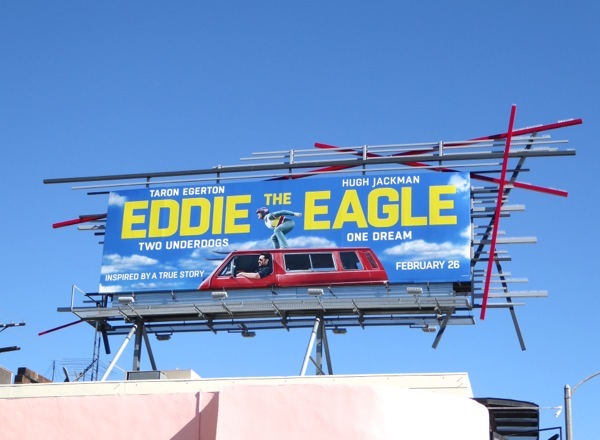 Plus it stars Hugh Jackman). 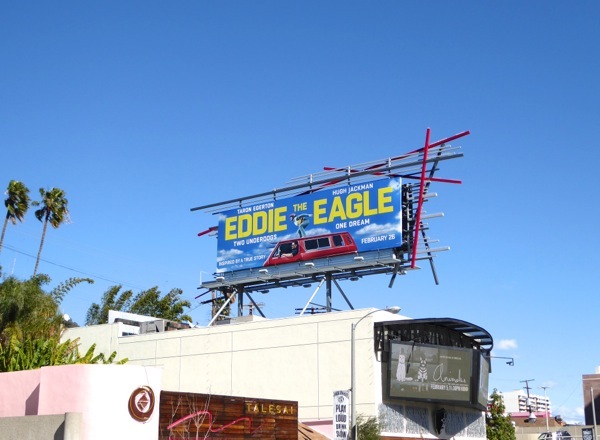 Every underdog has his day and from the looks of things, it's time for Eddie the Eagle to get a second chance at fame.